The Rhythm of Sao Paulo was produced especially for SP_Urban Digital Festival curated by Susa Pop / Public Art Lab in December 2012. 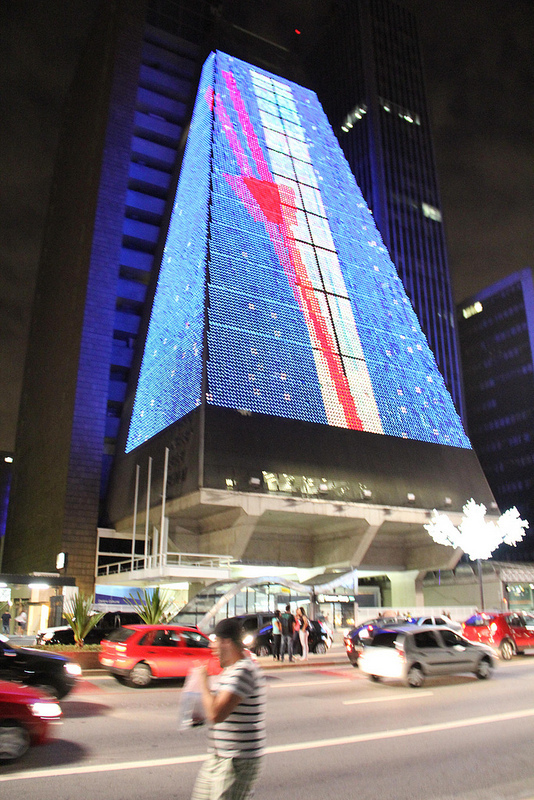 We were inspired by the triangular shape of building (FIESP in Sao Paulo), which reminded us a metronome. Hence, we connected this work with our existing art piece called The Rhythm of City, which consists of 10 real metronomes performing in the rhythm of 10 selected cities’ digital pace. “The Rhythm of Sao Paulo” allowed us to talk about one city and display its activity by quantifying geo-located social media data in real-time and in a large scale. It means, the artwork mirrors and reflects Sao Paulo’s digital pace of life. Moreover, the tempo of metronome is composed by the citizens of Sao Paulo. When the participation is not an aware act and work applies uninterrupted and real-time activity, then we call it unaware participation. Hence, this allows us to reflect upon life and embed it to our work. In a way, “The Rhythm of Sao Paulo” is like a clock tower and a huge-scale interface: one can say just from looking at look what is happening within the city. We have used Twitter, Flickr, Youtube, and Foursquare in order to get the real-time data and use it as a score.